This book reveals the strain of a moment in American cultural history that led several remarkable writers -- including Emerson, Warner, and Melville -- to render the stark rupture of loss in innovative ways. Pushing Protestant culture's sense of loss into secular terrain, these three key writers rejected Calvinist and sentimental models of bereavement, creating instead the compensations of a mature American literature whose 'originality' stemmed from its capacity to mourn the loss of a common culture and, through such mourning, to assent to new social and cultural realities. 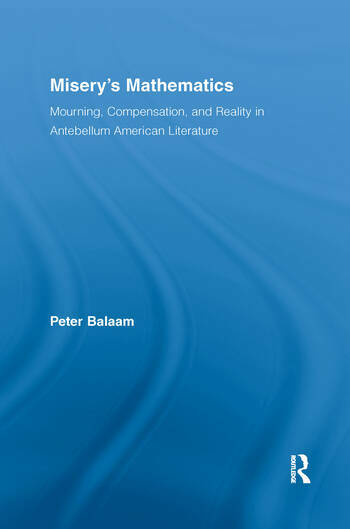 Balaam locates this appeal to 'reality' in the analogies antebellum writers drew between their experience of bereavement, and the experiences of uncertainty and disillusionment, that followed the revolutions in science, the winding down of creedal systems and the economic instability typifying the pre-Civil War era. Peter Balaam teaches English and American Studies at Carleton College.